I designed my own family tree when I began getting into research as a teenager. I hand-drew one for my parent’s anniversary and painted the tree, which was unique and pretty cool. They had it in their home for years. The challenge is having one big enough for people to read the text. I always try to photograph or save the interesting ones I see. For the sake of display, and even reference – I keep mine within reach so I can refer to it often – it’s nice to design a tree that is more like a piece of art that you can frame. I tend to favor the bow tie design because I like symmetry. I also designed one for use in scrapbooks. I did a fun one and some question sheets for my daughter’s grade school assignment, which will be in my family tree album under Gallery. And for a family reunion, Family Tree Maker was great at printing out a multi-generational tree that I taped on the entire wall. It was a show stopper and people kept going up to the wall and checking out how they all connected. There are so many creative people out there who have done wonderful family trees on their walls. Pinterest and Google Images are filled with them. So if you need ideas, that’s the best place to go. There are also websites that sell them for reasonable prices. 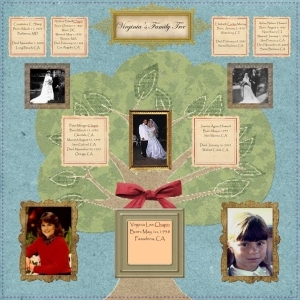 So check out the Family Tree album in Galleries and have fun designing your own.